The cloud isn’t just getting personal. Luckily for consumers, it’s also getting cheaper. Heck, a lot of it is now absolutely free. Cloud storage is becoming so ubiquitous and so cheap that Gartner Inc.researchers now say the ‘personal cloud’ will dethrone the PCas theepicenter of our digital lives by 2014. “Emerging cloud services will become the glue that connects the Web ofdevices that users choose to access during the different aspects oftheir daily life,” said Steve Kleynhans, vice-president of research atGartner in unveiling a new report on the trend just last month. 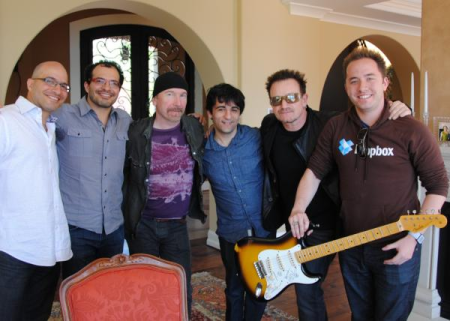 U2 rock stars Bono and the Edgejust announced they’ve invested in Dropbox. Here they pose with Dropboxfounders Drew Houston (w/guitar) and Arash Ferdowsi (centre). These personal cloud storage services are appealing for many reasons:you can automatically sync your files from a folder to aWeb-basedrepository where they can be accessed anywhere else with a login. Andthe files – documents, music, photos, video and more — can be synchedacross multiple computers and mobile devices (including smartphones andtablets) using various operating systems. So just how much cloud storage can you get for free? And with so manyfree cloud services out there these days, how are they different? Checkout some of the options. Storage amount:2 GB for free. Price: 50GBis $9.99 per month or $99 ayear; 100GB is $19.99 per monthor $199 per year; 1TB starts at $795 for five users in a plan designedfor groups and includes a large shared storage quota as well ascentralized administration and billing. Platforms:Windows, Mac, Linux for desktop. For mobile there’s iOS,Android and BlackBerry. Notable:Users can get 500MB for free by simply referring a friend toDropbox through email or socialmedia up to a maximum of 32 referrals(or 16GB of extra space free). And Dropbox picked up some rock starcache when U2’s Bono and the Edge recently announced they’ve investedan undisclosed amount of their hard earned mega millions in thecompany. Security breaches:In June 2011 Dropbox said “fewer than 100” of its 25million accounts were compromised for four hours when a bug in itsupdated authentication software allowed anyone to log into any Dropboxaccount by putting in just a user name but no password. CEODrew Houston sent an email to breached account users including hisphone number if they wanted to give him a piece of their mindpersonally. Or, he added “if you’d like me to call you, just reply withyour phone number and I’ll give you a call.” Will Bono or the Edge callyou if there’s another security breach in Dropbox’s future? Storage amount:A hefty 25GB for free. But take note that individualfiles can be no bigger than 100MB each, though that will change soon(see ‘Notable’ below). Price: Noneright now for anything over 25GB. But unconfirmed (so far)rumours began making the rounds in February that Microsoft is set tointroduce this tiered pricing system: $10 a year for an extra20GB, $25 for an extra 50GB, or $50 for an extra 100GB. Platforms:Windows and Mac. There are mobile apps for Windows Phone andiOS. SkyDrive can be accessed onAndroid two ways: through a mobile Webbrowser or through the OneNote app for Android. Notable: Fornow, no direct Android app capability. But in February,Microsoft unveiled a slew of updates planned for the next versiondubbed SkyDrive Wave 5: new desktop syncing, a SkyDrive Metro app forWindows 8, a URL shortener, direct sharing to Twitter, and an increasein the size limit for individual files to 300MB each. Description:Google Docs is Google’s existingcloud storage service.Google Drive is a new cloud service that Google is rumoured to belaunching any day now (ie, this month). Google hasn’tconfirmed ordenied this and no one’s sure if Drive would replace Google Docsentirely or simply be a premium version of it. Storage amount: Google Docs gives you 1GB free for uploaded files butthere are very specific file size limits forfiles created or convertedin Google Docs. Earlyrumours implied Google Drive will offer 1GB for free. But a screenshotleaked more recently seems to point to 5GB for free if Drive evermaterializes. Price: InGoogle Docs you can buy extra storage as follows: 20GB for $5a year, 80GB for $20 a year, 200GB for $50 per year or 400GB at $100 ayear. Rates beyond that range from 1TB at $256 per year to 16TB for$4,096 annually. Platforms:Windows, Mac, Linux. Besides a native Google Docs app forAndroid there are Web-based apps for mobile browsers for iPhone, iPad,BlackBerry and Windows phones. Notable:Google Docs recently added a Web-based spellchecking featurethat automatically red flags words that may be misspelled in documentsor presentations stored there. So even if files weren’t spellchecked intheir original version, this feature gives them the once over in GoogleDocs. Security breaches:In March 2009 Google confirmed that “a bug”accidentally allowed some Google Docs files to be shared without theirusers’ knowledge or consent. Google said less than 0.5 per cent of alldocuments on Google Docs were affected. Google took heat for theincident from groups like the Electronic Privacy Information Centre,which wanted the U.S. Federal Trade Commission to ban Google fromproviding any cloud services until a probe into the matters could bedone. Clearly, that never happened. Storage amount: Stash,now in public beta since January, is the syncingservice recently introduced by Mozy as a complement to its onlinebackup offering. With MozyHome Free storage you get 2GB free and youcan also use Stash. Price: Itcosts $5.99 per month for 50GB on one computer or $9.99 amonth for 125GB for three computers. You can add an additional 20GB ofspace beyond those levels for $2 per month. Platforms:Windows and Mac. The Mozy Web site says it’s “consideringadding Linux support based on customer demand.” There are mobile appsfor iOS and Android. Notable:Since Stash’s file syncing is automatic in real time, thelatest version of any file you create on one device is instantly storedon all your other Stash-enabled devices without you having to choosethe sync option each time. But…Stash doesn’t allow files to be sharedamong different users right now, although Mozy says that option willprobably be added later. For now, Stash offers syncing among multipledevices but no collaboration among multiple users. Security breaches:Still in beta and none reported yet. Storage amount:60MB for free, the stingiest of the options we’reprofiling here. Price: Youcan boost your storage to 1GB per month for $5 a month or$45 a year. Platforms:Evernote uses a combination ofsoftware and Web-basedservices. There are Windows and Mac desktop versions, plus Android,BlackBerry, iOS, and Windows Phone 7 for mobile. Notable: Youhave the option of encrypting bits of text within a file.To keep part of a document private – like a password, security code,phone number or personal content within an office email, for example –just highlight that passage, right-click and then choose “Encryptselected text.” A password must be used later for you or anyone else toview that selected text. Security breaches:None have come to light so far. There are many other free cloud storage services available, of course.But by dipping into all of the five brands here you could technicallyamass a combined total of just over 30GB of cloud storage without evenreaching for your credit card. Not a bad reason to take a walk in theclouds.